Nora Weiss posted this picture online of the black widow spider she found inside a bag of grapes from Whole Foods in Fairfield. 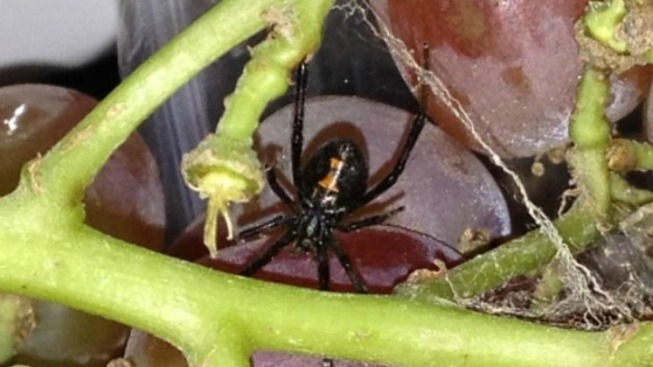 A Connecticut woman found a venomous eight-legged surprise in her bag of grapes on Monday — but she still insists she will stick to buying only organic produce. According to News 12, Nora Weiss purchased a bag of Sunview Organic Table Grapes from a Whole Foods store in Fairfield, Conn. When she took the grapes out of the bag to wash them, she discovered a black widow spider lurking in the bag. The spider was still alive. Whole Foods issued a statement saying that the claim could be true since no pesticides are used on organic produce. The store also offered Weiss a refund or replacement. Widow spiders are considered the most venomous spiders in North America. According to National Geographic, a black widow bite can cause muscle aches, nausea and paralysis of the diaphragm, making it difficult to breath. Human fatalities from black widow bites are fairly rare.